When people ask what they can learn from horses, it’s often from the standpoint of a human looking critically at an animal which would seem to be so very far below them in both intellect and consciousness. Which is why the following piece of horse wisdom is so compelling and helps explain why we really should pay more attention to our equine partners. Our white Andalusian mare Katarina was such a paradox. Her beautiful face with its huge liquid brown eyes was framed with an abundant mane which fell wildly over her neck and eyes and seemed to scream out to be touched. Unfortunately, that’s exactly what she did not want. Most people found this out the hard way – as they reached out to stroke her nose or touch her neck, her normal reaction set in like permafrost. Flattening her ears and pulling back abruptly, she indicated clearly that your invasion of her personal space was uninvited and unwelcome. If you missed the hint, she swiftly reinforced her wishes with a sharp nip or even bared teeth if you were especially slow. When Katarina first came to live with us she was quite difficult to catch and get close to and so I fed her outside while continually trying to handle and groom her a little more each day. I didn’t try to catch her at first and so each time she would walk away once she had had enough of me, often leaving the remains of her food uneaten. Emotionally, it was tough stuff – I felt frustrated, disappointed and re-buffed. I just wanted to connect with her so that I could look after her. I was being sympathetic and welcoming so why couldn’t she see this? Katarina, on the other hand, seemed completely unconcerned with my feelings. This process continued for some weeks until I decided that a new approach was needed and resolved to coax her into the stables to eat her dinner. If I could get her into a stable, I reasoned, then I could catch her, groom her properly and attend to her feet. This turned out to be good decision as she wasn’t keen to be on her own and so followed Walker happily into the barn and into her stable. It was from this point onwards that I began to understand Katarina a little better, even though I can see now that she was always quite clear on who she was from the moment she arrived. Contrary to my plans, trying to do anything much with Katarina when she was eating in her stable also turned out to be a bad idea. After a day at work and four horses to look after, all I wanted to do in my evenings was get everyone fed, groomed and rugged ready for the night so that I could collapse onto the sofa with my dinner. I needed Katarina to do things my way and straightaway. But after months of dodging her teeth and her bad temper, I finally realised that my way wasn’t working for either of us. Katarina basically hated her skin being touched and especially disliked it when I wasn’t present enough to go slowly and take my time. Even then, it was only just about bearable and rarely pleasurable for her. After consultations with vets and therapists, we concluded that she was in some considerable pain from a foot she had partially twisted as a foal. Thankfully, this was something I could help with and so after experimenting, we found that a mixture of main stream painkillers, herbal medicine and corrective shoeing helped to make her more comfortable. Once she seemed to be in less pain, I assumed that her attitude to contact might also improve. But while she seemed happier in herself, she became even clearer in her desire to keep people at a manageable distance. 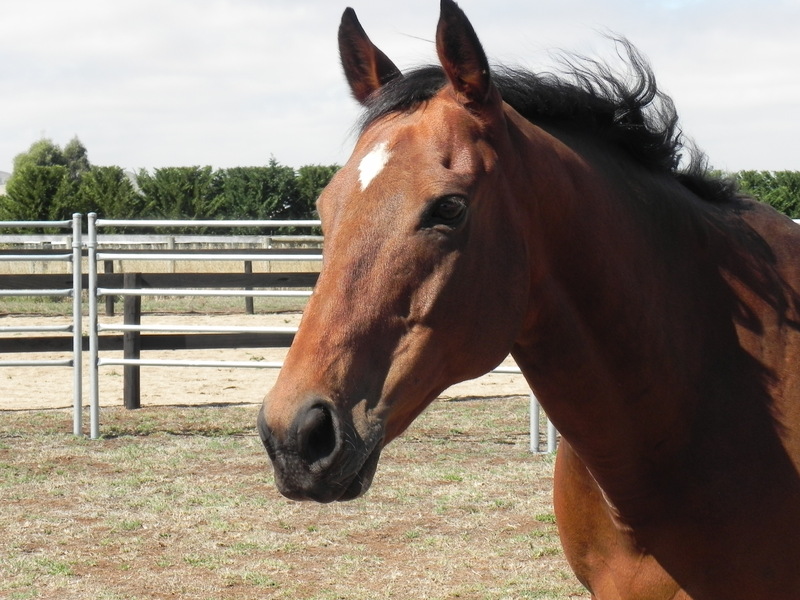 Sitting companionably with her in the paddock one morning some two years after she first arrived to live with us, something about the truth of Katarina finally dawned on me. As I pondered her sometimes aloof, grumpy and unfriendly attitude, I began to see that I was actually missing the underlying message. In her determination to interact with people on her terms, she was actually delivering a masterclass in effective boundary setting. What’s more she was delivering it repeatedly and consistently to anyone who didn’t properly respect her physical and emotional boundaries. Funnily enough, these were often the very people who struggled to set them in their own lives. By doing what needed to be done for her own comfort and peace of mind, she was showing me exactly what needed to be done in my own life. How frustrating it must have been for her as she kept repeating the lesson and patiently waited for me to catch on. When I finally started to appreciate her fearless talent for boundary setting, we got on much more effectively and I began to see how important it was in creating not just emotional and physical space but also in allowing her to be exactly who she was. She was able to be authentic every day precisely because she maintained her boundaries. She never apologised for needing her space and claiming it. She was always consistent in what she needed and did not primarily care about how others felt about this – that was their problem not hers. For Katarina, the result of this effective boundary setting was peace, calm, comfort and the ability to influence when and how people interacted with her. Lots of us need more physical and emotional space than we’re given or ask for, simply to make sense of our competing priorities. But most of us get used to operating without that space and so struggle to make much headway. If we are initiating a deliberate change, being unable to set boundaries effectively can completely derail what we are trying to do. The continual lack of space takes a toll on us which can eventually show up as unresolved feelings of anger and sometimes apathy. As we strive to make overdue changes, we can feel stifled by the people and circumstances that surround us. Our world applauds self-sacrifice and putting others first and so it’s quite hard to find a clear way forward through the conflicting demands of self and others. Often we end up lost in the frustration and guilt of meeting neither requirement very well. This is where Katarina’s wisdom steps in and directs us to take care of our own needs first so that by achieving a sense of balance and calm within ourselves, we can more effectively fit the jigsaw pieces of our life together. This might mean saying “no thank you” or “not now” or “not this week” or setting a physical boundary of “here and no further”. It may mean taking time and space for yourself or refusing to let others tell you who you are, how to be or what to do. This might be hard initially if you have normally put your needs after those of others; they may struggle to accept this change in approach by someone who is normally so accommodating. But once you’ve taken the first step of stating your needs and politely asking for those needs to be respected, it’s important to hold your ground. Empathise if you must, but be consistent and firm and in time people will adapt and come to respect you as someone who states what they need and follows through. Katarina passed away just over a year ago now. She is greatly missed by all of us but her wisdom endures powerfully. Our horses continue to teach Katarina’s boundary setting wisdom in all our workshops since it has proven to be such an important skill to create space for creativity, authenticity and change. Walker has chocolate tipped ears. It was one of the first things I noticed when he arrived as a small, bay thoroughbred, straight off the track but hardly grown up. His ears arouse feelings of mother-like tenderness and protectiveness in me so that I want to shield him from the big bad world. Unfortunately, this hasn’t always been possible and he’s ha d his fair share of ups and downs – most notably surviving a deadly bushfire, where I was of little initial help, together with a few nasty illnesses in his 20 odd years on the planet so far. But a part of me still sees the small, hesitant three-year-old from many moons ago and I continue to try to make life perfect and spoil him whenever I can. But in the last few years I’ve started to realise just how far Walker has come from those early years and I can now see him more clearly for the competent, wise and insightful leader that he is. To be honest, he’s been growing into this over many years. He didn’t start out that way and it’s fair to say that as a young horse he was overly dominant at times. But in the last 10 years he’s become quite remarkable and just this week, he’s caused me to look at him in awe and appreciation once again. Let me explain. 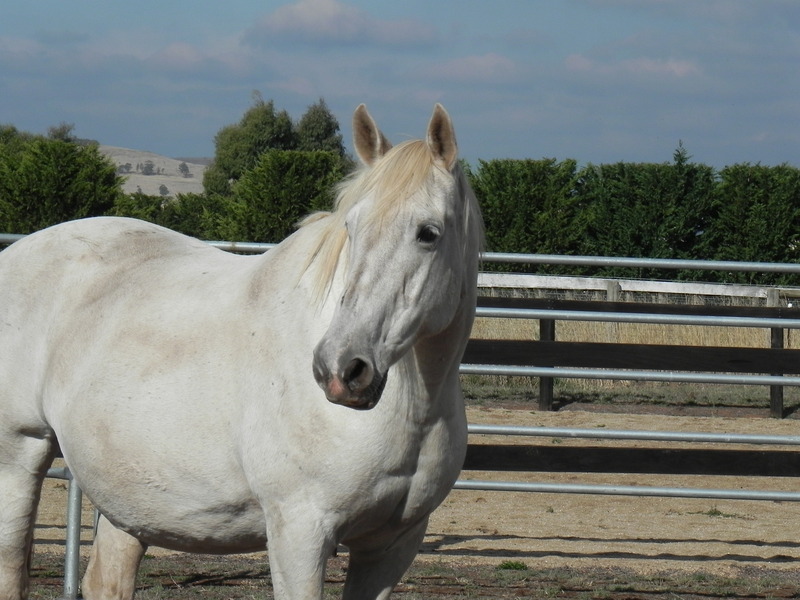 Our beautiful mare Katarina died some months ago and we were in no hurry to replace her in the herd. For the last 6 months the 3 remaining members of the herd have lived together quite companionably following their established routines and pecking order. A few weeks ago, out of the blue, a close friend of mine requested we take a look at a palomino quarter horse in need of a new home quickly. My partner and I had always assumed that the next member of the herd would find us rather than the other way around but we’d had also believed it would be another mare. Chex showed us how wrong we were and it was love at first sight, proving once again that horses often know best. Chex duly arrived last week and the process of integrating him into the herd began. I had been a little worried about how this would go, fearing that it might exhaust Walker or cause Edward and George undue stress. As it turned out Walker immediately and decisively took Chex under his wing, making it evident to the others that, as leader of this herd, he accepted Chex wholly and completely. As Chex then navigated the complexities of where he sat in the pecking order, Walker intervened when necessary, nurtured and groomed him and ensured Chex knew he was a safe companion to be around. On the occasions when things got a little fraught, he discharged the tension not by aggression, but by simply putting his body between Chex and the others, standing there peacefully until things grew calm and the adrenaline of the situation dissipated. Such is the level of respect accorded to him by the herd and such is the power of this authentic individual in action. In the days that followed, Walker has continued this process and has also deliberately given time and attention to both Edward and George individually, grazing and sharing hay with them both, before returning calmly to check on his new charge. He manages this complex process of balancing his herd with grace and the kind of innate wisdom and timing that I can only dream of achieving. He simultaneously accepts and nurtures new herd members while ensuring that existing members are valued and cherished. Crucially he only intervenes when absolutely necessary, letting each member of the herd form their own relationships and sort their conflicts out as they may, provided that they do not destabilise the whole. Essentially he is clear and supportive without being disempowering. And when I bring him in for dinner and breakfast he seems energised rather than exhausted, as though even he now realises the distance he’s travelled in wisdom and skill and the enjoyment that comes from knowing what’s needed and being able to do it with minimum fuss. In short he seems pleased – as though he’s called the latest member to the herd and is now revelling in the process. Through it all I watch and wonder how best to teach this kind of artful leadership? How best to show what is possible when you meet each member of the herd – human or equine – at the level they are at and give each the encouragement they need to work as whole. Walker understands the needs and quirks of each of his herd members while simultaneously offering a newcomer time to assimilate. He is the safe, reliable space for all of them, choosing dominance only when a subtler communication method does not work to set a boundary or when absolute clarity is quickly needed in a situation. And at the end of it all on a late summers evening, you can easily see the reward for his efforts – there he is, surrounded by the herd, wandering between piles of hay and eating peacefully with each one in turn, completely relaxed and true to himself. Is your Playbook shrinking your life?